You Don’t Need To Go Back To The Future To Change Your Life Today. 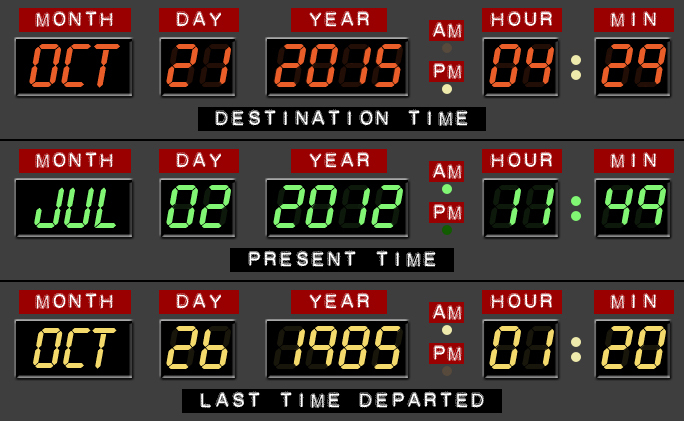 Today, 21 October 2015 is “Back To The Future Day”. In “Back To The Future II”, this is the day on which Marty McFly and Doc Brown return to the return to the future to save Marty’s future son from disaster, (at 4:29 pm to be precise). But it’s got me thinking about those times in my life when I wish someone had interfered with the events unfolding in my life. For a start, I can think of at least two ex boyfriends who should have been jettisoned into the far reaches of outer space before I had the bad luck to meet them. It would have been helpful if someone had made my path cross with that of The Husband at least 10 years earlier. Somebody could have replaced the school careers officer with somebody who could think about something other than just blindly pushing pupils into the university system. I actually wanted to study beauty therapy but was told I had “too many ‘O’ levels”. Then there was the coven of dreadful bosses I had, each of whom did the minimum they could get away with whilst making the lives of their team members as unpleasant as possible. There was one in particular who, every time you entered her office, would quickly slam her laptop shut to hide the fact she had been doing her weekly shop at Sainsburys. But be a minute late with an assignment? Woe betide you. If only someone could have made me sverve away from those particular firms. The more you stop and think about it, the more you realise that there are many, many occasions when, had the hand of fate been given a shove in the right direction, your life may have turned out quite differently. It’s the old destiny versus free will conundrum. Are we the product of an arbitrary fate? A bit of inter-stellar flotsam being pushed here and there to experience the good, the bad and the mundane willy nilly? Or are we a product of our own choices? Our lives are really the sum total of all the choices we have ever made. I’m not saying we were never pushed or coerced into making those choices. Nor am I saying we have always been free to make the choice we wanted. But when I think about my life, most of my choices have been mine. And if Marty McFly and Doc Brown had turned up to change the course of events, I reckon I’d still be more or less exactly where I am right now. We don’t need time travel. We can change the course of our destiny by making different choices RIGHT NOW. We can choose to say sorry, to phone an old friend, to leave a relationship. We can choose to stop smoking, drinking or eating junk. We can choose to be happy no matter what life throws at us – and in that choice alter our entire destiny. That has to be worth more than a flying car, doesn’t it? "Review: Keep Colds At Bay With ColdZyme Mouth Spray"
"How To Choose The Best Toothbrush For Adults And Children"